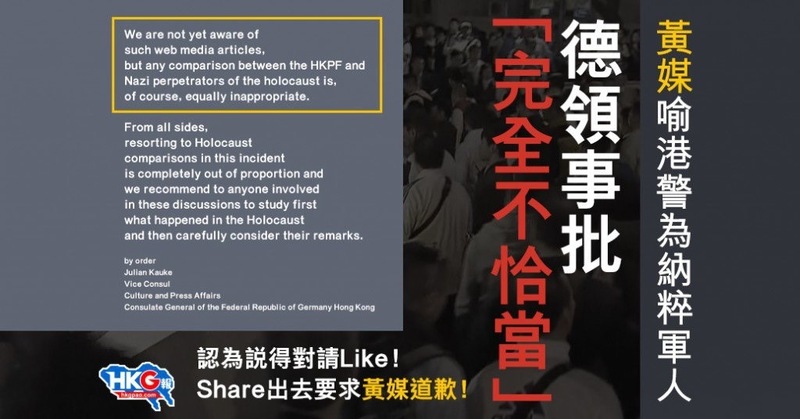 We are not yet aware of such web media articles, but any comparison between the HKPF and Nazi perpetrators of the holocaust is, of course, equally inappropriate. From all sides, resorting to Holocaust comparisons in this incident is completely out of proportion and we recommend to anyone involved in these discussions to study first what happened in the Holocaust and then carefully consider their remarks. Following the surrender of Nazi Germany, many (German) soldiers that participated in the holocaust massacre in the concentration camps never reflected much on their crimes. They felt that they were merely following orders and therefore felt no moral remorse or that they were wrong. On Feb 22, over one thousand (actual number was over 38,000) police officers turned up to support the seven policemen, what were they thinking? Did they not also feel that the seven policemen commit no wrong?